I think back to 3 years ago as I set out on this whimsical adventure. The name chosen was not by accident. It was not by happenstance. Yes, it was for a reason. You see, I can’t stop thinking about the fact that we were created for this moment. We were set apart for a time such as this. In addition, God prepared us for this time. Furthermore, He made us for a purpose – every single one of us. If we are a follower of Christ, we have been molded, and shaped to be used for Him. We are used for His Kingdom purpose. We are his hands and feet. This life we live is no longer ours, but His. We are each made unique yet uniquely in His image. He has given us trials to walk through with Him to grow in our faith and our understanding. Each trial has moved us and shaped us to look more like Him who calls us. Yes, God created us for a purpose. He has shaped you, moved you, molded you for His reasons and His purpose to use you for a very specific time and a very specific place. So, as we prepare for Orphan Sunday that leaves us with one question. 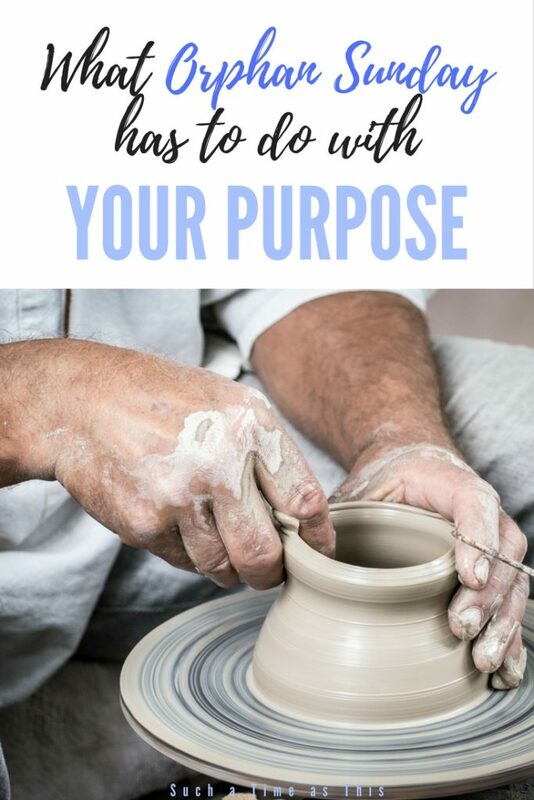 If we are all created for a purpose, what’s yours? The Potter from Christian Alliance for Orphans on Vimeo. I’m going to leave a few websites listed below for your own personal research. 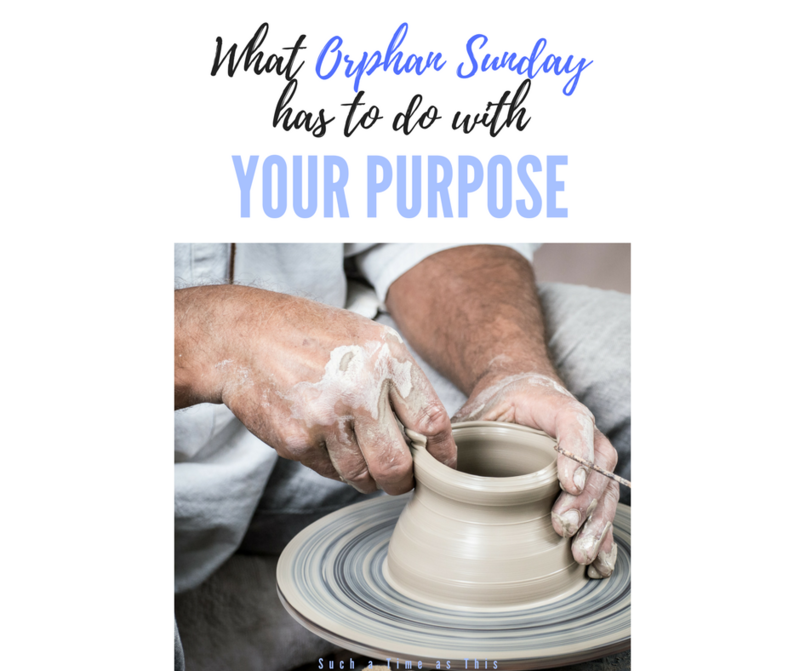 If you feel led, on Orphan Sunday or any other day to read more on our call to love and serve orphans, feel free to click below. First, the graphic and the video of pottery make me want to try all the more! I think it would be a challenge but so cathartic! Anyway, thank you for your resources and for your passion for wounded and hurting children. There are so many children who need care in a multitude of ways! When we think of the reason we are here…for such a time as this, it really excites me! To be a part of something so life-changing as the reason for my existence. I am enjoying all the adoption posts I’ve been reading. I like how in the video, God takes the clay that was discarded and molds it. Christ wants us to love the way He loves! I love how God molds us and makes us who we are. With God, he is our home and he makes us new. My purpose changes with each season in my life to some degree and yet it is always to love others, and follow Jesus. It’s such a great gift to see that God can use us and wants to. For our unique purpose and using our unique gifts. This moment. This messy situation. This beautiful gift from God. Such a time as this. It’s no accident that we’re here in this time, country, city, family. God places each of us exactly where he did for a reason! For such a time as this…yes! What great resources to help on this journey of helping children. 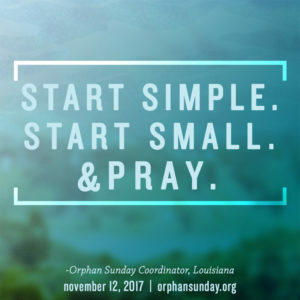 I had never heard of orphan Sunday before! Thank you for sharing! I loved the resources provided and plan to share them with my friends and family this Sunday! God’s purpose for me is something I’ve been trying to figure out. I wish it was simple like a book you get when you are born from God explaining your purpose! Amen amen amen! The verse is a favorite verse of mine especially God sets the lonely up in families….. No matter how openhanded we may feel, God promises to be our defener, comforter and guide because His purposes for each of us matters.